The above poem, The Road Not Taken by Robert Frost, is a theme I found constant within the Humble Administrator’s Garden in Suzhou, China. If Japanese gardens are about sequence, borrowed scenery, and framed views while Korean gardens are about adding built into landscape while leaving nature as untouched as possible, Chinese gardens are about discovery. The Humble Administrator’s Garden is just that. Moments of contemplation and decisions that leads you to unexpected spaces. What I found most intriguing, in contrast to Japan and Korea where there is a defined path; here, you are able to wander and contemplate, to make your own path. Though Chinese gardens have a sense of freedom this does not mean that the spaces are not highly designed. There is a distinct play on soft versus hard within the space. There are moments of relief and moments of intensity. The notion of representation is introduced with naturally found rocks that stand on podiums and the rocks that created caves that compressed you and gave you the sense of moving through a mountain range. This break from the rigid is what made me thoroughly enjoy the garden. You saw a place where hierarchy was scratched and it became about the user and his journey. The one place were social class did not matter. In contrast to Japan where the gardens have a narrative that has been carved out for you and the discovery of the narrative is through the path you take from one frame to the next, the Administrator’s Garden left the narrative open for your own interpretation and allowed a sort of freedom that was seldom found in the manicured landscape of Japanese Gardens. When we were given the opportunity to visit Suzhou this past weekend many of us knew from our brief introduction to garden landscapes in Asia that this was a must-see destination. Suzhou has often been called the ‘Venice of the East’ due to its vast canal network and thriving river life, but its nine gardens make it a quintessential example of Chinese classical garden design. 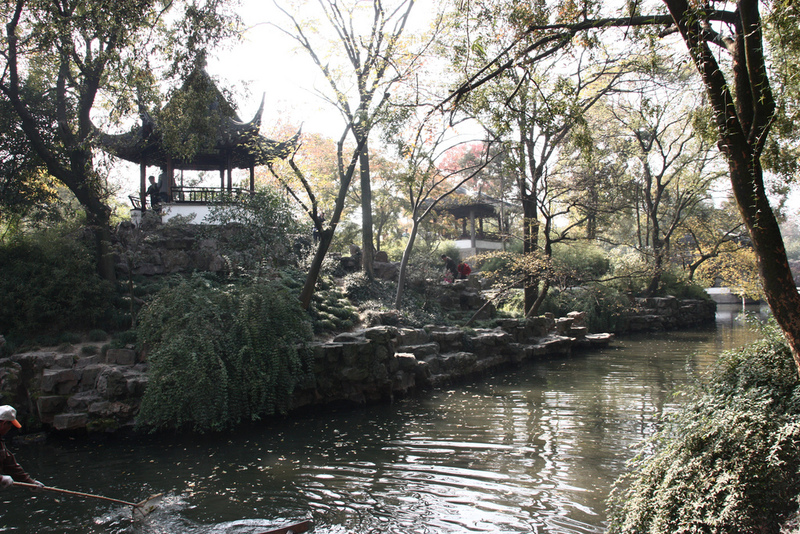 With four of the gardens recognized as UNESCO World Heritage Sites, the city’s historic urban plan is very much influenced by the unity between Chinese culture and nature. The gardens themselves are intended to emphasize the metaphysical importance of natural beauty, and thus are designed as spaces of peaceful harmony and contemplation. Upon arriving in Suzhou, this picturesque mental image was immediately disbanded by the reality of an increasingly industrialized city. What was expected to be a quaint Chinese community, was now diluted with drab mid-rise towers and bustling multi-lane highways. Where was the beautiful Suzhou I had witnessed in lectures and books? The economic growth and development occurring all across China had obviously reared its ugly head in Suzhou, and although the gardens remained intact, they were simply a few diamonds in the rough. Disheartened, I immediately headed for the first of the four gardens, hoping to find sanctuary from what I had witnessed of the city thus far. The Master of the Nets Garden, with its intimate courtyards and meticulous landscapes was a fine introduction to the classical beauty of Suzhou’s gardens. I separated from the group and meandered through the labyrinth of dark halls and sunlit courtyards. However, just as I began to slip into a state of peaceful contemplation, I was barraged by two loud megaphones from a passing tour group. How could one possible enjoy the intended serenity of this garden with a blaring noise echoing off every surface? Once again, the illusion of Suzhou’s grandeur was eclipsed by the reality of a Chinese culture undergoing rapid change. Our introduction to these gardens through text and images back home could not have been more deceiving, as they failed to capture the human element – the experience of actually walking through the garden. This noisy atmosphere was not isolated to the Master of the Nets Garden, and got subsequently worse with each garden we visited. Starkly juxtaposed to the silent and serene gardens of Japan, and Kyoto in particular, Suzhou’s classical gardens were quickly becoming a bastardized experience of nature. The very harmony these gardens were designed to embody was being undermined by the need for quick and satisfactory ingestion of experience through tour guides. The following clip demonstrates the juxtaposition between the Japanese garden atmosphere and the disturbing phenomenon occurring in Suzhou’s classical gardens.